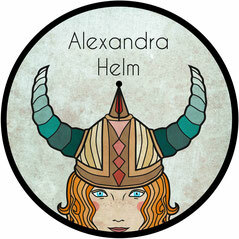 My name is Alexandra Helm and I was born in 1986 in Offenbach. After moving way too many times I came back to this magical, beautiful and interesting City! I successfully completed my studies in Communication Design at the Hochschule für Gestaltung in Offenbach and then decided to go my own way as a freelance Illustrator and Graphic Designer. I walk this amazing path now since 2015 and I am happy and thankful about every single day that I can practice this wonderful and amazing job! I work in many different areas for example Children´s Book Illustration, Logo-, Poster-, Postcard- and T-Shirt Design. I am open for any kind of commission and happy about making new contacts, so please feel free to send me an email!